Sometimes a video game becomes rare not because of anything the buying public has done, but because of something the company does. 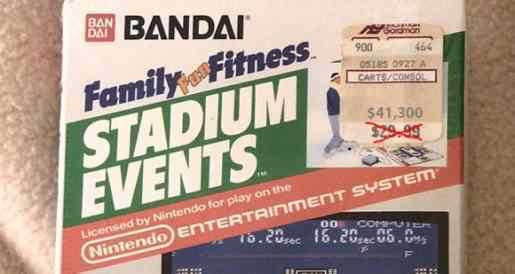 When Nintendo bought the rights to the Bandai game Stadium Events, they retitled it World Class Track Meet. However, about 200 copies of Stadium Events are believed to still be available under that name, so if you find one at the local pawn shop, you’d better hang onto it. A sealed copy of the game recently sold at auction for $41,300, making it the most expensive NES game in history. The game is widely available in PAL format, but for the NTSC American release? It’s considered the rarest official NES cartridge in existence. All because of the title change by Nintendo. World Class Track Meet carts are everywhere! While it’s not a rare video game you might own, it is a rare video game that you had a chance to own once upon a time.